The section below is from my page about Longines. I have long been unclear about the relationship between Baume & Co. in London and Baume & Mercier in Switzerland. I contacted Baume & Mercier and they told me that, although they had started as two legally independent but closely connected companies, the British company and the Swiss branch in Les Bois had parted in 1918 and gone their separate ways. In fact, it turns out that in 1918 William Baume left the original Swiss company and started a completely new company in Geneva, initially under his own name, but then in 1919 in partnership with Paul Mercier. There is therefore no continuity of manufacturing history between Baume & Mercier and either the original Swiss or British Baume companies, the only connection is that William Baume once worked for the original Swiss company. Baume & Co. continued to import Swiss watches into the UK, principally Longines watches, but also Baume watches from a factory in La Chaux-de-Fonds that had been taken over in 1909. What happened to the Les Bois operation is a mystery. Baume & Company, and Baume & Mercier. Baume & Company was initially created as the London branch of Baume Frères, a watch manufacturer based in the village of Les Bois in the Swiss Jura Mountains. In addition to Baume Frères and other manufacturer's watches, Baume & Co. were for a long time the exclusive importers of Longines watches into Britain and the British Empire. In 1888 Baume & Co. opened a watch factory in Coventry. In 1909 Baume Frères took over an existing watch manufacturer in La Chaux-de-Fonds, manufacturing watches under the name "Baume". Although the Swiss and British companies were separate legal entities they remained closely connected until 1918, when William Baume left Baume Frères to set up his own company in Geneva. In March 1919 he was joined by a friend, Paul Tchereditchenko, a Ukrainian who had adopted the name Mercier, and they formed Baume & Mercier. There was no connection between Baume & Mercier and Baume Frères or Baume & Co. I am quoting dates from "A Hundred Years of Time" published by Baume & Co. in 1949. I find the dates quoted by Baume & Mercier to be inaccurate. In 1834 two brothers, Louis Victor Baume (? - 1887) and Pierre Joseph Célestin Baume (1819 - 1894), founded the company Baume Frères (Baume Brothers) in Les Bois, Switzerland. They made English style watches by the établissage method; materials, blanks or rough parts were delivered to "out workers" in their homes, and finished parts collected and assembled into watches. The brothers insisted on high quality and personally inspected each watch, their motto was "Accept only perfection. Only manufacture watches of the highest quality". However, although they may have been well made, the watches were not at first very technically advanced. Many extant movements signed "Baume Geneve B&L" have cylinder escapements and no train jewels. The company made rapid progress in its first ten years and two more brothers, Célestin Auguste Félicien and Joseph Eugène joined. In 1844, ten years after the founding of the company, the brothers decided to stop using export agents and to set up their own sales organisation. The choice was between Paris or London as a base, and London was chosen because it was starting to outstrip Paris in international trade. Célestin Baume founded a company in London. As well as the market in Britain, this opened up the whole of the British Empire to Baume's watches. The English and Swiss companies were separate legal entities from the start, although of course there were strong family bonds. Célestin settled in England, adopting an English spelling of his name, Celestin, marrying an English woman, Elizabeth, and becoming a naturalised British subject. Célestin Baume was joined by a partner Joseph Lézard (1811 - ?) and they traded under the style of Baume & Lezard, manufacturers and importers of Geneva watches. Joseph Lézard was born on the continent (in census' his place of birth is given as Belgium, Luxembourg and France) but settled in England and became a naturalised British subject. In the 1851 census he is 39 years old with wife Zephirine and five children aged between 12 and 4. Movements were signed "Baume Geneve B&L" for Baume & Lézard. In 1852 the address of Baume & Lezard was 75 Hatton Gardens. In 1863 they were listed at 21 Hatton Gardens. Baume & Lezard exhibited watches at the International Exhibition of 1862. The partnership of Baume & Lezard was dissolved on 25 March 1872. Lezard would have been 60 so he most likely retired. Kathleen Pritchard says that Baume & Co. became the British agents for Longines in 1867. However, "A Hundred Years of Time" says that Baume & Co. became agents for Longines in 1876. Because the two stated years contain the same digits I wondered if the last two had become transposed, but the book quite clearly states that Longines was founded in 1867, and that in 1876 Célestin Baume, soon afterwards succeeded by Arthur Baume, became the sole representative of Longines for Great Britain and the whole of the British Empire. In 1876 two of Louis Victor Baume's sons, Alcide Eugène and Joseph Arthur (1853 - 1936), took over management of the company. Alcide ran the operation in Les Bois, while Arthur ran the London operation, looking after sales and marketing to the UK and British Empire. Arthur Baume became a naturalised British subject in March 1881 and, on 28 Feb 1884 at the church of St Giles, Camberwell, married Mary Rebecca Mangham. Célestin Baume died 27 September 1880. One of his executors was his nephew Louis Celestin Alexandre Baume (1852 - 1894), a native of Les Bois who had been naturalised as a British citizen on 10 June 1879. Arthur Baume had a partner Alexander Baume until 31 December 1890 when the partnership was dissolved. This was Célestin's nephew Alexandre, presumably a son of Louis Victor but not mentioned in the company records. Alexandre died in Germany in 1894. Arthur Baume was a prominent figure in Europe thanks to his charitable works. A member of the Royal Geographical Society, he also became vice-president of the British Horological Institute. He was made a knight, and later an officer, of the Legion of Honor, and was twice decorated by French President Poincarré. The King of Belgium made him a Grand Officer of the Order of Leopold II. He retired in 1923 and died in Folkestone, at the age of 84, on 24 September 1936. When Arthur Baume retired he was succeeded by his nephew Alexandre Alcide Célestin Baume, who had worked for the London company since 1904 and had been made a director in 1912. Alexandre's brother William Adolphe was a director of the La Chaux-de-Fonds factory from 1915 to 1918. Louis Baume was born in London and studied watchmaking in Neuchâtel. He then worked with his father at Baume & Co. until the second world war broke out. During the war he served in the Royal Artillery and became a Japanese prisoner of war for 3½ years. In 1946 he became Chairman of the Swiss Watch Importers' Association. In 1947 he succeeded his father as Joint Director of Baume & Co. He served on the Council of the British Horological Institute for 20 years, and was Chairman for some of this. In the early 1960s he left the watch business and went into bookselling. He was also a keen mountaineer. He died in 1994 at the age of 74. In 1950 (?) Baume & Co. became a limited company. The latest mention of Baume & Company Limited trading as an independent entity that I have yet found was in 1964. Their registered office was at 59-60 Old Broad Street Avenue, Blomfield Street, London E.C.2. Baume & Co. subsequently became a subsidiary of Time Products Ltd, who also took over Carley & Clemence Ltd., Harris (Jewellery) Ltd., Hirst Brothers & Co. Ltd., and J. Weir & Son Ltd. Time Products continued to distribute Longines watches until Longines decided to set up their own UK office. The advert reproduced here from 1886 gives an idea of the wide range of watches that Baume & Co. were importing at that time; not just Longines watches but also ordinary watches of every description, in different qualities, also fine and complicated watches, watches with lever escapements and ¾ plate keyless watches. In September 1888 Baume & Co. opened or purchased a watch factory in Coventry. 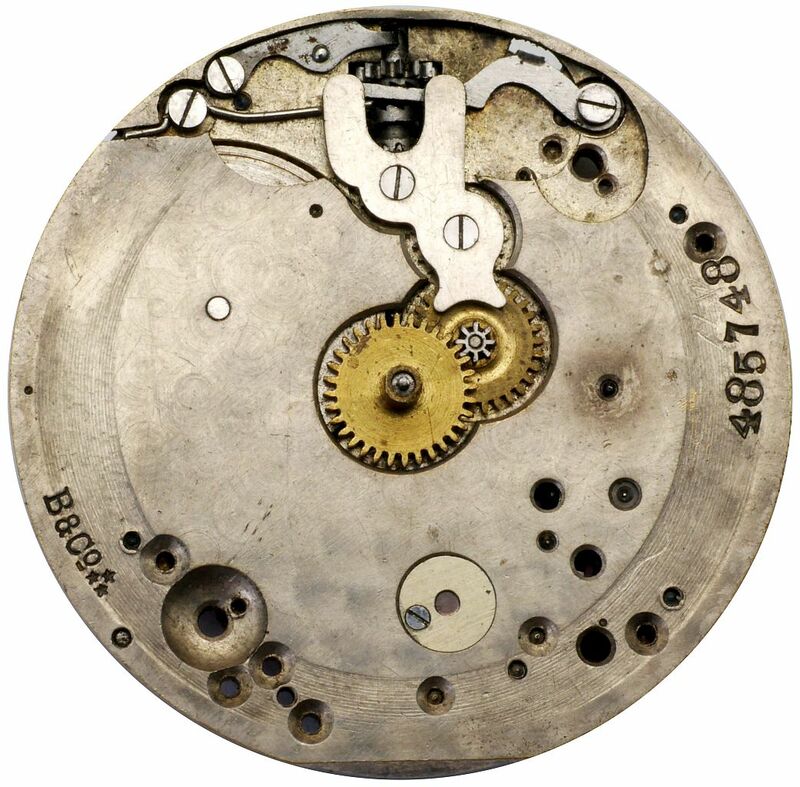 The Swiss branch of Baume didn't always make simple movements with cylinder escapements. By the late nineteenth century it had leapt ahead technically and was known for chronographs, tourbillons, and grand complication models including watches with minute repeaters and calendars. In 1890 a Baume watch with a single overcoil balance spring and tourbillon chronometer escapement took eighth place in the Kew watch trials with 83.9 marks. In 1892 the same watch, No. 103018, was back at the Kew trials, after adjustments, and took first place with 91.9 marks, beating the previous record of 91.6 marks held by a Stauffer & Son watch. The Baume watch is now in the Baume & Mercier museum collection. The record stood until 1901, in 1900 Baume advertised that they still held the Kew record with 91.9 marks. Baume & Co. also successfully entered complicated watches at Kew. In 1887 a split seconds minute recording chronograph was awarded 85.1 marks and the endorsement "especially good." On 1 March 1909 a branch of Baume was created by Alcide Baume in La Chaux-de-Fonds by the takeover of the firm Paul César Jeanneret. Alcide Baume was succeeded in the management of the Les Bois and Chaux-de-Fonds branches by his son William Adolphe. It was this William Baume that left to set up Baume & Mercier. After William Baume left, the factory in La Chaux-de-Fonds continued manufacturing watches under the name Baume. Watches with the name simply "Baume" are products of the La Chaux-de-Fonds factory. Despite what many vendors say, these watches have nothing to do with Baume & Mercier. At some point the original Swiss company changed its name from Baume Frères to Baume & Cie, and later for a brief period Baume & Mosimann. 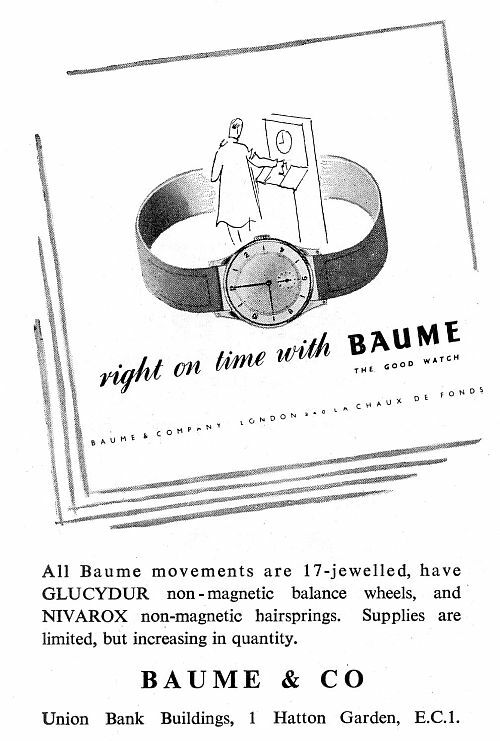 The advert here from 1947 for Baume watches says that all Baume movements are 17 jewelled and have Nivarox balance springs and Glucydur balances, which are all top quality features. By this time, although not in this advert, Baume & Co. were styling themselves "London and La Chaux-de-Fonds". In 1918 something happened, a family dispute. William Baume left the company and went to Geneva where, in November 1918 at 2 Rue Céard, he set up in business as W. Baume, fabricant, purchase and sales of horological items and jewellery. In March 1919 he was joined by a friend, Paul Tchereditchenko, a Ukrainian who had adopted the name Mercier. A new company named Baume & Mercier was formed with the same address and purpose. Links with Baume & Co. in Britain were severed. Baume & Co. continued to sell watches made in the La Chaux-de-Fonds factory in the UK under the name "Baume". What happened to the Les Bois factory is not known. Although Baume & Mercier claim a founding date of 1830, it is clear that William Baume is the only link that joins them to the original company. When it was founded in Geneva in March 1919 (not in 1918 as some say), Baume & Mercier was a completely new company. Rue Céard today is a pedestrianised area with swanky shops, it is very unlikely that any manufacturing took place there. It is more likely that Baume & Mercier began as a sales and marketing operation without any manufacturing capability. Baume & Co. did not import Baume & Mercier watches. Baume & Co. Ltd. v. Moore (A. H.) Ltd. In 1958 in the case of Baume & Co. Ltd. v. Moore (A. H.) Ltd. before the Supreme Court of the United Kingdom an injunction was granted against the use of Baume & Co.'s registered trademark ‘Baume’ in the name ‘Baume & Mercier Geneva’ on watches sold by A. H. Moore. 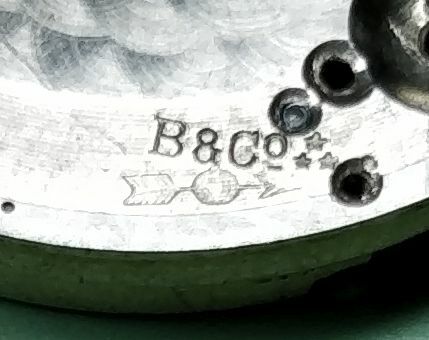 The two AB marks shown here are sponsor's marks of Arthur Baume, Managing Director of Baume & Co., London, from 1876 until 1923. The first style of mark with cameo letters in curly script within an oval surround was registered at the London Assay Office on 18 November 1876. A week later on 25 November 1876 an incuse mark of the letters "AB" was also registered. The second cameo mark shown here, with block capital letters AB within a rectangular surround was first registered on 24 April 1883. Swiss watches with gold or silver cases were imported into Britain without hallmarks until 1874, when some Swiss made cases began to be sent for hallmarking at British assay offices. Baume & Co. obviously caught onto this trend in 1876. English watchmakers objected to this, but the practice continued until 1877 when it was stopped from 1 January 1888 by the Merchandise Marks Act. Two punches with the cameo AB mark were registered on 14 September 1888, as were two punches with the incuse mark. I was puzzled by this because the 1887 Merchandise Marks Act effectively stopped importers of Swiss watches from sending them to be hallmarked after 1 January 1888. However, in September 1888 Baume & Co. had opened or purchased a watch factory in Coventry, which explains these four punches; they were for use at the Coventry factory. A punch with the second style of mark, block letters in a rectangular shield, was registered with the London Assay Office on 1 March 1907, no doubt in anticipation of the requirement that all imported watches must be hallmarked in a UK assay office, which came into force on 1 June 1907. Additional punches with the same mark were registered in March, August and November 1907. Punches with the second style of mark, block letters in a rectangular shield, were registered with the Birmingham Assay Office in January and July 1901. Birmingham was the principal jewellery making centre of the UK at the time and it seems likely that Baume were having items such as watch chains made there. Baume & Co. acted as the London agents for Longines for many years, from 1876 to the 1960s. Kathleen H. Pritchard in "Swiss Timepiece Makers, 1775-1975" says that Longines and Baume & Co. in London signed a marketing agreement in 1867, Longines' first year of operation. This is incorrect. In the advert reproduced here from the Horological Journal of April 1915 Arthur Baume is listed as an owner of Longines, so it seems likely that he purchased a share of the company. Longines' first lever movements had a distinctly "continental" appearance. 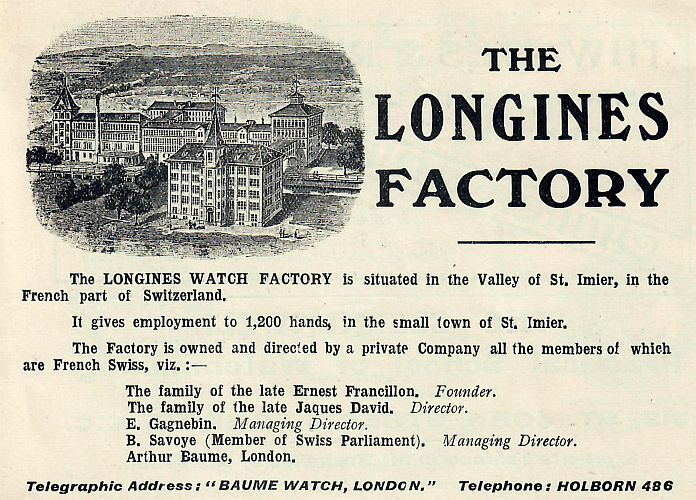 Baume/Longines realised that they could achieve greater penetration of the British market if their watches appeared, and were finished, like English watches. 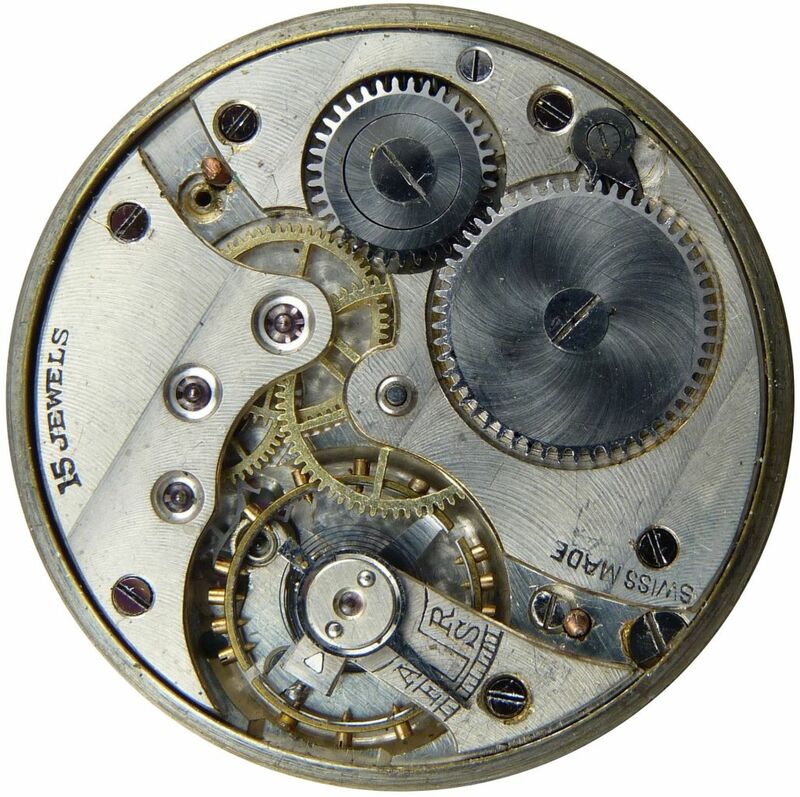 Starting in 1880 Longines introduced a series of movements that that looked much more like English three quarter plate movements, with concealed winding wheels and frosted gilt plates. The earliest published mention of Baume in conjunction with Longines that I have found is a notice in 1885 regarding the International Inventions Exhibition where Baume were showing, amongst of items, "The new Longines watches and chronometers", which is curious. Perhaps Longines introduced some new, improved, models at that time. I have a Longines pocket watch with London Assay Office hallmarks for sterling silver, the date letter "B" for the year 1877 to 1878, remember that date letters span two calendar years. The sponsor's mark is the curly AB was registered by Baume & Co. at the London Assay Office on 18 November 1876. Otherwise unmarked Longines watches often bear the mark "B & Co." for Baume & Co. next to the Longines movement calibre number under the balance. The "B & Co." mark is usually followed by three stars in a triangle formation. However, not every movement with the Baume marks is a Longines. The picture with London Assay Office import hallmarks for sterling silver is from a Longines watch with a Borgel case that bears both the AB and B&Co marks, as well as the FB-key trademark of François Borgel, the famous Geneva case maker whose company actually made the case in Switzerland. The AB mark was the sponsors mark officially registered at the Assay office for assay purposes, the B&Co mark is simply a trademark. 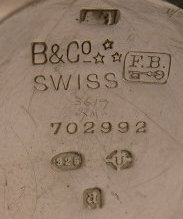 The "B & Co." mark is sometimes confused with that of Stauffer's "SS & Co." mark followed by three small triangles, which can at a glance look very similar. In 1885 Stauffer had actually started to use a mark with three stars, which Baume pointed out was their registered trademark, so Stauffer quickly swapped the stars in their mark for triangles. Simply finding Baume's name or trademark on a watch doesn't mean that it is necessarily a Longines. Baume also imported watches from their own factories and watches with Fontainemelon ébauches, which carried Baume trademarks. 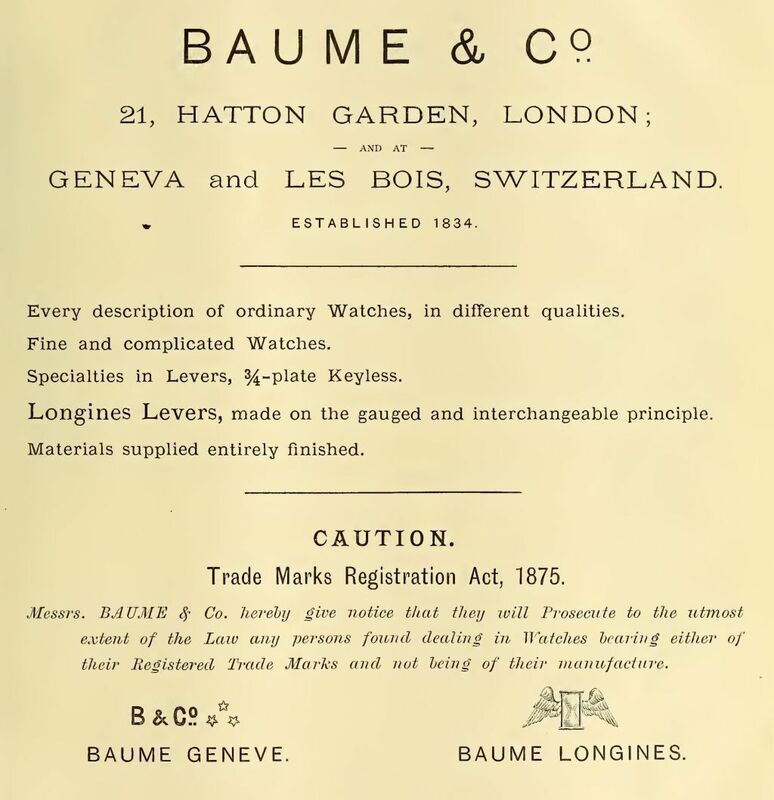 The first line of the Baume & Co. advert from 1886 reproduced above says "Every description of ordinary Watches". This is separate from the mention of Longines watches, which refers to them as "Longines levers". Before the Longines factory was opened in 1867 the comptoir of Auguste Agassiz had produced watches with verge and then cylinder escapements, but from 1867 the Longines factory produced only lever escapement movements. The "ordinary watches" that the Baume advert refers to would have been the bar movements with cylinder escapements that were very widely manufactured in Switzerland during the nineteenth century, mainly by unnamed établisseurs. In addition to watches from their own factories in Les Bois and La Chaux-de-Fonds, and from Longines, Baume also imported watches with Fontainemelon ébauches, which carried Baume trademarks. The details below of one of these movements are from my movement identification page.